Electrolux are one of the most popular and best known companies on the market for household appliances, with their inventory ranging from refrigerators to blenders to, of course, vacuums. They’re known particularly for creating sleek products that are made with the user experience in mind to ensure convenience and usability. This Electrolux UltraFlex Canister Vacuum is no different and is highly commended for it’s status as an ‘all-rounder’ vacuum, which happens to also perform particularly well on pet hair. We were so impressed at its versatility and incredible positive feedback from previous buyers that we awarded it the best canister vacuum in our round up of the very best vacuums for pet hair across a range of categories. Good For What Jobs and Surfaces? The look of the Electrolux UltraFlex is understated and sleek with a black and grey color scheme complemented by a flash of deep red on the body of the canister. As with all vacuums of this type, although the canister itself is neat and compact, the long hose and vacuum part are separate so the unit as a whole can’t really be considered compact. The quality of the UltraFlex Canister is evident in the solid feel of the product and the intuitive engineering. It feels robust and the plethora of special features indicates it’s worth the price tag. At 11.6lbs, it clocks in at weight considered average for a canister vacuum, although it’s easy manoeuvrability will have you believing it’s much lighter. It has large rear wheels and a low center of gravity, so you can be assured it won’t tip over as you whizz around your home with it. Travelling is easy thanks to its smooth swivel steering, which can neatly vacuum around corners, furniture and into awkward spaces. It’s very easy to use on stairs and is low enough to fit and clean neatly under furniture too. Some people find using canister vacuums awkward as their design means you inevitably have to pull them behind you as you clean, but the Electrolux UltraFlex is just as easy to move around with as an upright thanks to its smooth manoeuvrability. Upholstery nozzle – Extracts any pet hair and dirt trapped or wound into upholstery fibers. The strong, cyclonic suction and slew of added features work to ensure that the Electrolux UltraFlex puts in a great cleaning performance across a multitude of surfaces. It’s reported to pick up 33% more dust than its leading competitor! At its highest power, the turbo cylone spins at 240 km per hour while twin inlet channels ensure that airflow is maximized and suction consistent throughout the life of the vacuum. It’s particularly effective at extracting pet hair from deep carpets and even furniture – for the latter, you’ll need to use the included upholstery nozzle. Unlike standard vacuums where pet hair can get tangled around the brushroll, the UltraFlex benefits from Electrolux’s brushroll clean technology whereby the trapped hair is removed and the brushroll cleaned at the touch of a button. It also tackles pet hair on hardwood floors with no problem. This is the category where the UltraFlex Canister really comes into its own thanks to its supreme versatility. Canister vacuums are traditionally thought to be better suited to cleaning just hardwood floors but this model performs just as well on thick, plush carpets too. It has an on/off brushroll switch and three different level height adjustments for varying carpet thicknesses. The two included nozzle accessories are designed for upholstery and bare floors, respectively. The eight-foot hose and telescopic nozzle mean that cleaning ceilings and your car are no problem either. Soft wheels ensure there’s no scuffing or scratching of hardwood floors while the small head means vacuuming the stairs is easy. However, the small head also means that the cleaning path of this model is somewhat narrow, at just 11.5 inches. This essentially means that it can cover slightly less ground than some of its competitors for each stroke of the vacuum. The easy manoeuvrability of the Electrolux UltraFlex means getting right up to the edges of skirting boards is no problem at all. If you have any especially tricky corners, tools like the telescopic wand and crevice tool will be able to clean into the most awkward of nooks and crannies. The Electrolux UltraFlex is especially well suited to users with allergies or asthma. As well as being bagless, it sports a fully sealed HEPA filtration system, which captures 99.7% of allergens, dust and irritants. The filter is also washable, so there’s no need to continually invest in costly replacements. In addition, the dirt cup opens at the bottom so users are less exposed to the dust fumes when emptying. It has an adjustable suction that means you can clean delicate areas and surfaces – like your curtains, for instance – without worrying that it’s going to be sucked in and ripped up by the powerful cyclonic technology. The UltraFlex Canister also runs comparatively quietly, according to a number of user reviews. Good news for late night cleaners! 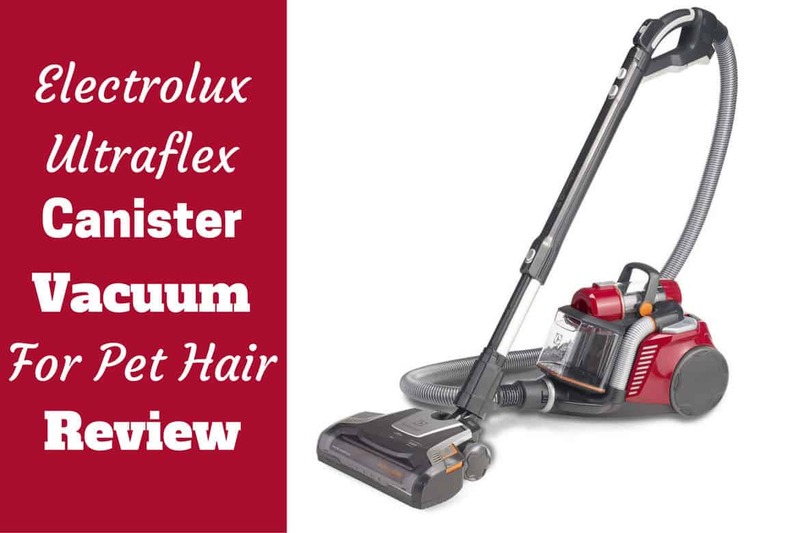 It’s no wonder the Electrolux UltraFlex is so popular; its versatility and maneuverability is almost unrivalled in the canister vacuum market while its cleaning performance on pet hair and general dirt is greatly effective. Added features like the sealed HEPA filtration system, brushroll clean technology and adjustable suction mean the minor cons of the model are easily outweighed by the positives.